The global expanded perlite market is rising steadily benefitting from the superior physical properties of expanded perlite that paves way for demand from several end-use industries. This includes building and construction, agriculture, and food and beverages among others. Expanded perlite displays capability to expand up to twenty times in volume from its original volume on being heated at very high temperatures. This property finds usability in oil well cementing, concrete floor fill, foundry cores, and crucible toppings. Apart from this, expanded perlite finds extensive application in the building and construction sector owing to its green characteristic for energy saving pursuits. According to Transparency Market Research, the global expanded perlite market was valued at US$1,102.0 mn in 2016 and is likely to be valued at US$1,699.4 mn by the end of 2025 clocking a moderate 4.9% CAGR therein. The global expanded perlite market can be studied on the basis of application and geography. 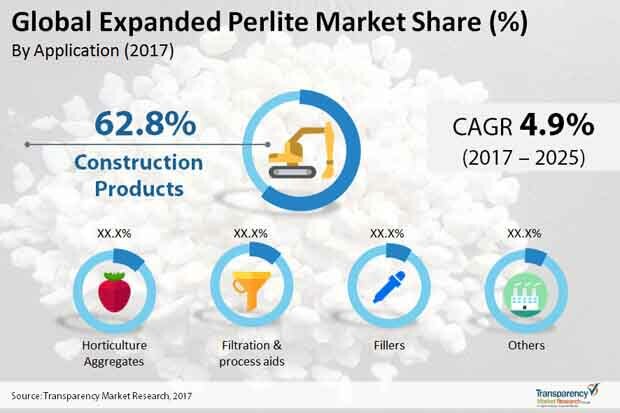 The key application segments of the global expanded perlite market are construction products, filler, horticulture aggregates, filtration and process aids, and others. Construction products application segment holds dominance in terms of consumption amongst all. As a result, the demand from construction products attracts the leading revenue over other application segments. Firstly, the light weight and superior insulation properties of expanded perlite finds application for loose-fill insulation in masonry construction. Some other advantages of expanded perlite include enhancement of fire ratings, filling cavity of concrete block, and reducing noise transmissions. Horticulture is also emerging to be a promising application segment of expanded perlite. Rising demand for greenhouse horticulture to serve the increasing demand for quality fruits and vegetables is fueling the demand for expanded perlite for the manufacture of green roof. Not only this, the excellent water retention properties of expanded perlite that helps to provide aeration and optimum moisture retention for plant growth has helped improve crop yield. This factor is also benefitting the expanded perlite market. Filtration and process aids application segment is anticipated to display rapid growth over other application segments over the forecast period. This is ascribed primarily to the increasing demand for expanded perlite in beer breweries. Due to the inert and non-toxic characteristic of expanded perlite, it has received safety certification from several food regulatory bodies to be used in food contact applications. Expanded perlite’s unique chemical structure performs filtration of impurities without absorbing any content. Oil and gas industry holds promise for the growth of expanded perlite market in the near future. Expanded perlite fids application in mining, shale gas drilling activities, and provides thermal insulation in oil wells. The number of oil rigs that are expected to become 20,000 across the world by 2025 is likely to propel the market’s growth over the forecast period. Geography-wise, North America posted the leading consumption for expanded perlite in 2016. Powered by the U.S., the region attracted a revenue of US$279.5 mn in 2016. In the U.S., the booming oil and gas industry and increasing shale gas exploration pursuits are positively influencing the expanded perlite market. The growth in the region is also ascribed to the presence of several leading players and a robust consumer base. However, Asia Pacific is estimated to display the leading growth rate from 2016 to 2025 due to the increasing demand from several end-use industries. Leading players in the global expanded perlite market include Imersys SA, Supreme Perlite Company, Cornerstone Industrial Minerals Corporation, and Silbrico Corporation. Each of the companies is profiled for their key business attributes of product portfolio, financial standing, and SWOTs. Expanded perlite is the form of perlite product obtained after the loss of water and molecule up till its softening point, where its volume increases more than 35 times its original volume. They possess various characteristic features such as high insulation and acoustic properties. They have excellent water retention properties and has relatively high water density. The report estimates and forecasts the expanded perlite market on the global, regional, and country levels. The study provides forecast between 2016 and 2025 based on volume (Kilo Tons) and revenue (US$ Mn) with 2016 as the base year. The report comprises an exhaustive value chain analysis for each of the product segments. It provides a comprehensive view of the market. Value chain analysis also offers detailed information about value addition at each stage. The study includes drivers and restraints for the expanded perlite market along with their impact on demand during the forecast period. The study also provides key market indicators affecting the growth of the market. The report analyzes opportunities in the expanded perlite market on the global and regional level. Drivers, restraints, and opportunities mentioned in the report are justified through quantitative and qualitative data. These have been verified through primary and secondary resources. Furthermore, the report analyzes global average price trend analysis of expanded perlite. The report includes Porter’s Five Forces Model to determine the degree of competition in the expanded perlite market. The report comprises a qualitative write-up on market attractiveness analysis, wherein application and countries have been analyzed based on attractiveness for each region. Growth rate, market size, raw material availability, profit margin, impact strength, technology, competition, and other factors (such as environmental and legal) have been evaluated in order to derive the general attractiveness of the market. The report comprises price trend analysis for expanded perlite between 2016 and 2025. The study provides a comprehensive view of the expanded perlite market by dividing it into application type and geography. The expanded perlite market has been segmented into construction products, fillers, horticulture aggregates, filtration & process aids, and others. Application segments have been analyzed based on historic, present, and future trends, and the market has been estimated in terms of volume (Kilo Tons) and revenue (US$ Mn) between 2016 and 2025. Regional segmentation includes the current and forecast demand for expanded perlite in North America, Europe, Asia Pacific, Latin America, and Middle East & Africa (MEA). Additionally, the report comprises country-level analysis in terms of volume and revenue for end-user and product type segments. Key countries such as the U.S., Germany, France, the U.K., Spain, Italy, India, China, South Africa, Mexico, and Brazil have been included in the study. Market segmentation includes demand for individual application in all the regions and countries. The report covers detailed competitive outlook that includes market share and profiles of key players operating in the global market. Key players profiled in the report include Imerys SA, Supreme Perlite Company, Cornerstone Industrial Minerals Corporation, and Silbrico Corporation. Company profiles include attributes such as company overview, number of employees, brand overview, key competitors, business overview, business strategies, recent/key developments, acquisitions, and financial overview (wherever applicable).